I made a couple changes to this Poor Girl Eats Well recipe. It turned out delicious! A great soup if you're feeling a little under the weather, especially since it only takes about 15 minutes to make! 1. 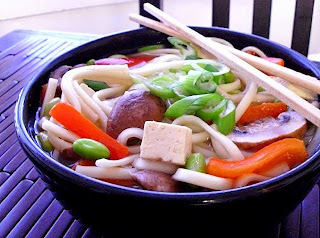 In a large soup pot add stock, water, udon seasoning, garlic, soy sauce, edamame, bell pepper & onion. Boil for 2-3 minutes. 2. Add udon, tofu, mushrooms and boil for 2-3 more minutes. 3. Stir scallions in & serve. I check out your blog ALL THE TIME. I love it!!! 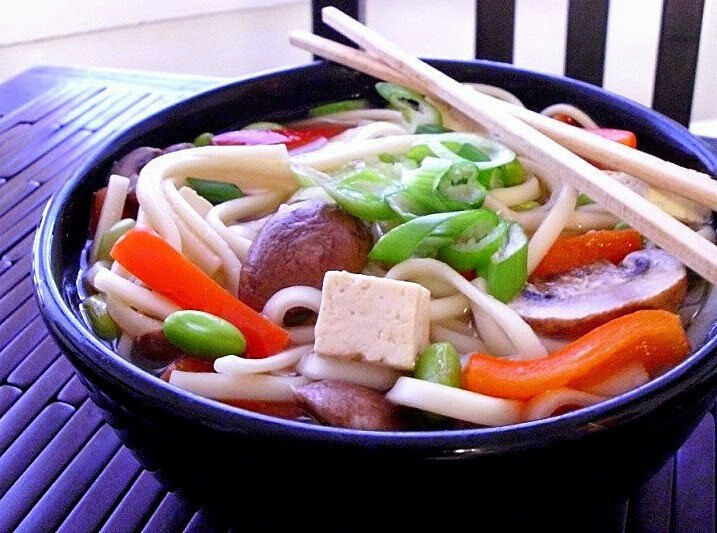 I tried finding udon noodles at the store today and couldn't spot them. Is there a more common substitute, or should I try an Asian market? Sometimes they have them in the refrigerated section by the tofu, or dry noodles in the asian aisle. If not, any asian market will carry them.